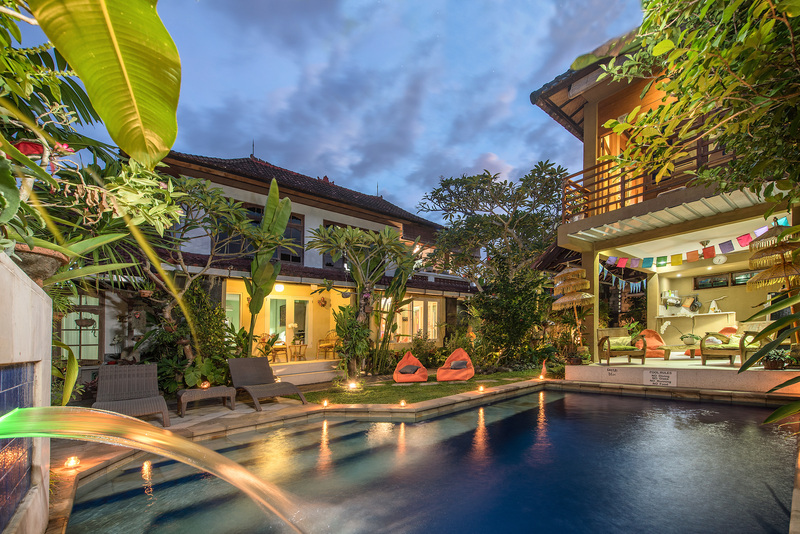 Lumbung Suite – Angel House Ubud. Boutique 3 suite hotel or Whole Villa Rental. Authentic Bali experience. Unique Accommodation. Lumbung Suite is situated above the Bale. This suite has pool and garden views with beautiful sunrises viewed from bed or the private balcony. The queen sized bed comes with draped mosquito net, quality linens and has its own private entrance. Lumbung is equipped with both AirCon, ceiling fan, and insect proof ensuite bathroom. The private balcony looks East with wide fully opening windows and is WOOD LINED and features a traditional Bedeg ceiling. All suites at Angel House are set in a safe and secure walled garden. The beautiful outdoor swimming pool is 1.6 metre deep, with wide sandstone pool steps and swim-up shelf and is adjacent to the bale. The perfect space for breakfast, yoga, reading or relaxing. The bale also has a guest kitchen with gas cook top, toaster, sandwich maker and electric kettle. Angel house is only a short walk to the traditional fresh food market (Pasar Mas), supermarkets, restaurants, Temples, art shops / wood carving / furniture / glass blowers. There is an ATM & bank close by and an authorised money changer as well as the local hospital, Klinik Mas with a pharmacy, and Doctor and pathology service. Lumbung room with QUEEN bed, draped netting, wooden lined and traditional BEDEG woven ceiling Plus wide opening windows onto your private veranda. Wooden Lumbung room with wide opening windows and views East for sunrise. View of temples from Lumbung stairs. Rock garden next to bale. View of Lumbung suite above Bale. Try a range of tropical fruits. Traditional methods of cooking rice ensure the taste is fantastic. Rice fields just behind Angel House. A range of fresh spices in daily cooking. Walk the quiet roads behind Angel House and experience our village life in Mas.